Well over a year ago the Daytona International Speedway (DIS) embarked on a task that even the great Hercules might have shied away from. That is to search the world over for every car that ever won, what we now call the Rolex 24 at Daytona, and transport them to Daytona Beach, Florida for a 50th anniversary reunion and heritage display. Tim Pendergast of Jacksonville, Florida was hired by the Speedway to track down these historic automobiles and get permission from the current owners to showcase them in the temporary building the Speedway was constructing on the grounds in front of the Speedway. Pendergast is a vintage car expert and has worked with Speedway president Joie Chitwood III in the past in locating and displaying historic cars. 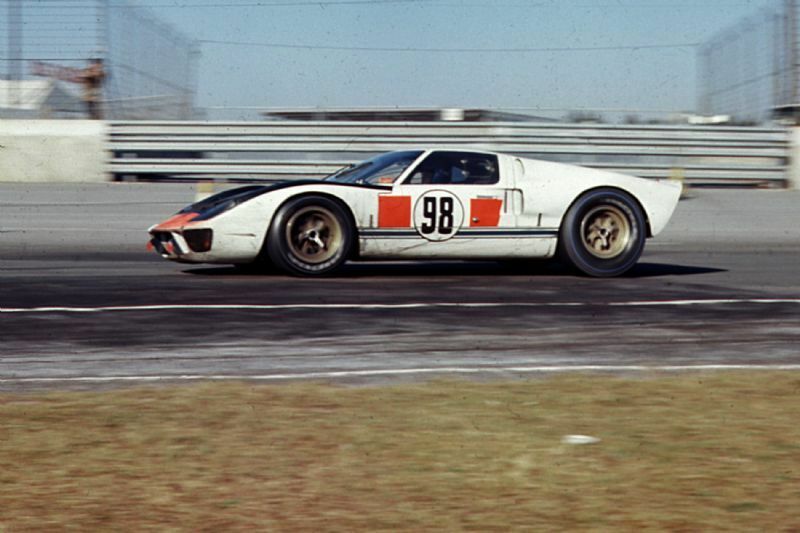 Of the 45 cars (some had won more than once) that had won at Daytona almost half were easily located because they had been featured in automotive publications, raced in historic events or ensconced in automotive museums. Locating the rest would require some good old-fashioned detective work which meant long hours on the phone talking to sources or in front of a computer sending out dozens of emails to automotive contacts around the world. 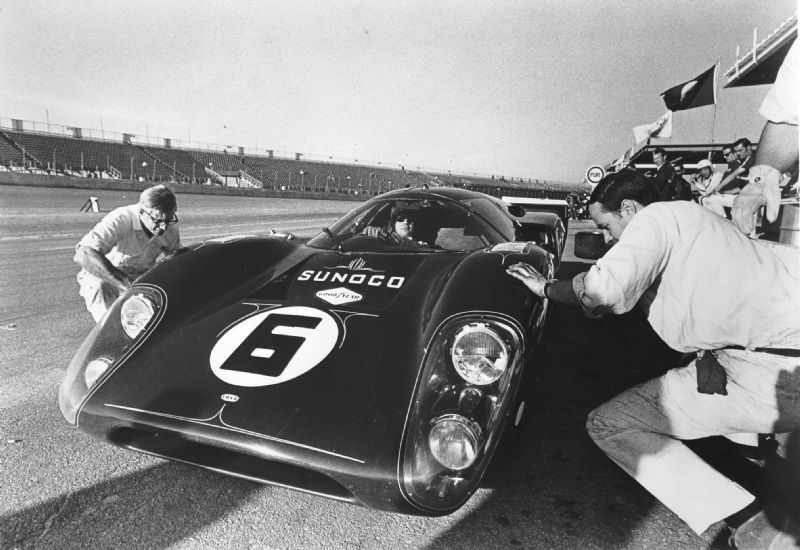 In the end 29 historic cars were assembled at the 2012 Daytona 24 Hours on January 26 – 29 for a once-in-a-lifetime reunion of vintage racing machines. The cars that didn’t show or couldn’t be located are a story unto themselves. The owners of some of these historic cars just didn’t want to be bothered, which is amazing in itself. For some of the no-show cars it would have cost the Speedway a small fortune to ship them to the United States. Just to transport the winning Porsches from 1980 and 1991 to the U.S. from Europe would have cost $56,000 and that didn’t include any fees to the owners. The Speedway decided to pass on that. 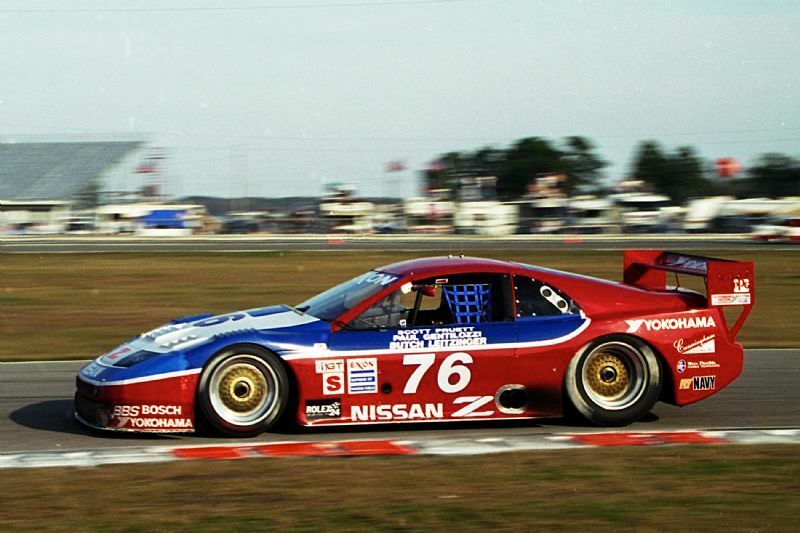 The Nissan R91CP that won Daytona in 1992 was in the Nissan museum in Japan and would not be coming. The Ferrari 333SP driven by the late Gianpiero Moretti to victory in 1998 couldn’t be located even after the Speedway issued a worldwide alert for the car. In fact not a single one of the five winning Ferrari cars made it to Daytona for the reunion, a real disappointment for Ferrari fans. A couple of the cars didn’t make it because they no longer exist. 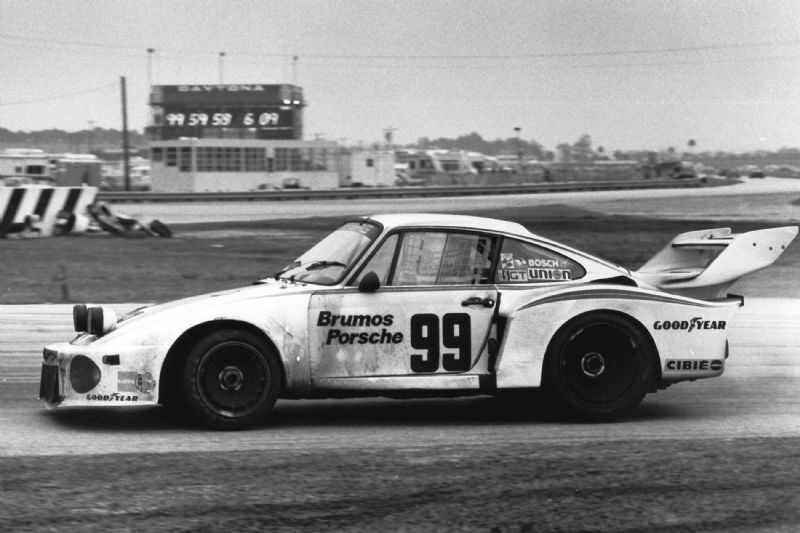 One was the Brumos Porsche 911 Carrera RSR that Peter Gregg and Hurley Haywood drove to victory in 1973. After the 1973 race it was shipped back to the Porsche factory in Germany where engineers disassembled it in order to examine every modification made to it. The intent was to find out what worked and didn’t work in order to build more race winning cars. In 1975 (no race in 1974 due to the energy crisis) Gregg and Haywood won again in another Porsche 911 Carrera RSR. Later that car was sold to the Diego Febles Racing Team but on a fateful day in Mexico the truck carrying the car went off a mountain road and the race car was destroyed. No idea what happened to the driver of the truck but no doubt it was not good. The official beginning of the 50th anniversary celebration did not occur at the Speedway but at the Daytona Beach Ocean Center the evening of January 26, 2012 where the historic cars were displayed, food was served and speeches were given by many notables from the racing community. The following morning (Friday the 27th) the cars were driven on the streets of Daytona approximately five miles to the Speedway much to the delight of the hundreds of spectators who lined the sidewalks. The route had to be carefully planned to avoid manhole covers and rough pavement since many of the 25 cars that made the trip had very low clearances. On race day (Saturday the 28th) the vintage cars were brought to the track for a 50th anniversary photo session at the start-finish line. This would be followed by the cars doing several laps around the track with some being driven by legendary drivers like Brian Redman, Bobby Rahal and Dario Franchitti. The photo shoot was delayed by several minutes because several hundred overeager fans, myself included, rushed over the pit walls and across the grass area in front of the start finish to get photos of the cars and drivers. Not until a platoon of track security guys showed up did the crowds disperse so the Speedway could take the photos they wanted. The Daytona Beach News-Journal was right when they indicated that the reunion of all these previous winning race cars was a once-in-a-lifetime opportunity. For racing fans young and old alike at Daytona this January, the 2012 Rolex 24 At Daytona will be a race to remember. Well done Louis! You perfectly captured what for many of us was the highlight of this year’s 24 hours of Daytona. All that’s missing is that special sound of those cars as they blasted down the front straight. Watching all those historic and irreplaceable cars I couldn’t help think that somewhere in Daytona that weekend were a couple of vintage car insurance agents that collectively held their breath for three straight days. They probably had to be hospitalized for nervous exhaustion when they got home. Great job, again…..now, if we only had a time machine…..
Great job. These events must be keep going for older to remember and teach and learn the younger. These great moments of the past must live for ever. It is a pittty that some cars did not show but nevertheless the ones appear its great. Keep going strong. Good job Lou, especially your period pics. Seems a shame to have gotten just over half the cars………and no Ferraris!? I Just got Morretti’s 333SP, I put it out on displayed at Cavillino but has not moved under it’s own power in 12 years, so I missed out on displaying it at Daytona. Car came with no spares and 15 year old tires and obsoleate, but buitiful wheels. Car was Started for first time by me last week and it does sound as good as it looks, the car is now in full MOMO decor and the Ansa boys put a in memory of G Morretti’s on the sail panel in respect to the cars first owner. Just a quick correction the RSR from 1973 was not sold to Diego Febles, it was sold to the Rebaque-Van Beuren-Rojas team (RVR), the champions of Mexico and yes it was destroyed going to a race, along with the truck carrying it but with no harm to the mechanic who was driving the thing. I was wondering why Diego Febles (from Puerto Rico) was having the car towed to Mexico. Now it make sense. To be fair, Diego did race Porsche 911 in the classic Brumo’s colors with the number 58 on its sides to a 2nd overall and 1st in GTO in the 1978 24 hour race. 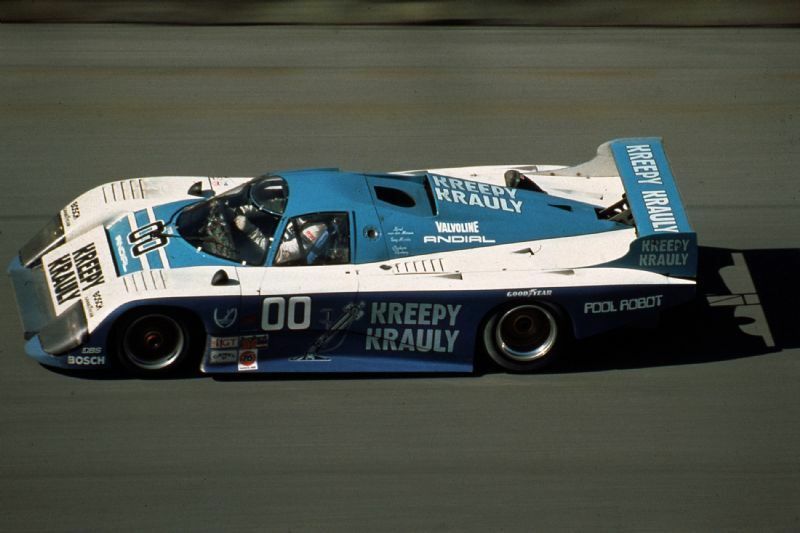 The GTO winner at Daytona in ’78 ( Diego Febles/Alec Poole) was the same car to finish P2 overall at the 12 hours of Sebring in “77(Diego Febles/Hiram Cruz) It is chassis# 911 460 9054, purchased by Diego Febles from Peter Gregg in January of 1976. it was the #59 car that won Daytona in ’75(Gregg/Haywood). I worked a lot on that car, and crewed many races for Diego, along with my dad, Jesus Leira. Great article! I have one comment regarding the information for the 1969 winning Penske Lola-Chevy. You say the 69 race was Chevolet’s first international win. I would have thought that Jim Hall’s Team Chaparral wins in Europe at Nurburgring 1000 (using the Chevy 327 in the 2D in 1966) and the Brands Hatch win (using the Chevy 427 in the 2F in 1967) would qualify for 1st International wins for Chevolet? Of course Glenn is right. ’69 Daytona was definitely not Chevrolet’s first. Not only did Chaparral win at the Nurburgring in 1966 (Hill/Bonnier, 2D) and at Brands Hatch in 1967 (Hill/Spence, 2F), but also won Sebring in 1965 (Hall/Sharp, 2). Having said that, the organizers did a fantastic job in assembling so many winning cars. Having been involved is similar efforts, but on a much lesser scale, for historic race weekends, I can appreciate the enormity of the task and applaud the results. Lou-Thanks for putting together the coverage of this once-in-a-lifetime event. Great photos as usual. I was chagrined at the lack of coverage of the past winners and other vintage and historic cars at Daytona by Speed TV. Bob Varsha made a comment that many of the past winners were there on display and did a parade lap but no coverage of the cars, people, etc. at all. They didn’t even show the parade lap. newer ones running in this year’s Daytona 24. Thank you again for this. I see someone above regretting the lack of a time machine: I don’t – each of your articles and all its great pictures transport me right back without fail. Thanks you again and looking forward to the next (master)piece. Thanks Vincent and thanks all for the compliments and factual corrections. It is appreciated. 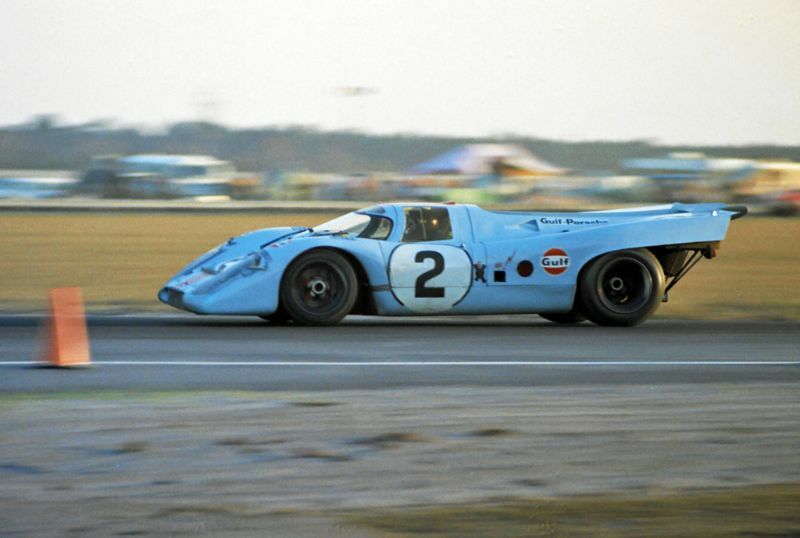 The Gulf-Porsche 917 #2 is the 1971 winning car driven here by Jackie Oliver. Thanks again Lou, for taking us to Daytona 50th. Again, Superb writing and great shots. I don’t feel like I missed out now. The sounds of 917’s, 512’s and the 936’s still make their music in my memory as I followed your account. Wonderful story telling, so many memories. More please.